Get Ashampoo Burning Studio Elements 10 free for timing limited | aeBeta : IT Resources and Reviews , Software Tips and Promotions ! Many people asked me about the free Burning softwares. Of course, if you can get Nero for free, it can not be better. But in fact, for family users, to buy a Nero License is not wise choice. Ashampoo Burning Studio Elements is some kind of great choices for normal users. Expecially when Ashampoo is giving some big Promotion when some cooperation happened. And if you’d like, you can search “Ashampoo” in aeBeta to learn more about Ashampoo Promos. This time, Ashampoo Burning Studio Elements is runing for free! There is a wide range of disc burning software to choose from and many programs suffer from offering almost too many options and therefore becoming quite complicated to use. If all you want t do is to burn a disc as quickly as possible, Ashampoo Burning Studio Elements may be the tool you have been looking for. The program can be used to create your own CDs, DVDs and Blu-ray discs as well as creating copies of existing discs. Copying discs is a simple matter of inserting a disc, selecting the Copy option and inserting a blank disc when prompted to do so. Ashampoo Burning Suite Studio Elements is also capable of burning and creating a number of popular disc image formats including ISO and CUE/BIN. The suite can be used as a backup tool to safeguard your data, and large backups will be automatically spanned across multiple discs as required. When the time comes to restore your backed up files, this can be achieved in a few mouse clicks. With the ability to rip music from CDs, create audio and video discs, and create covers and labels for your discs, Ashampoo Burning Studio Elements manages to keep everything as simple as possible without limiting the number of features available. The program is ideal for beginners, but an advanced mode is also available for more experienced users. 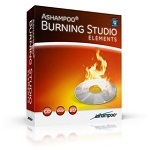 Ashampoo Burning Studio Elements 10 is licensed by Ashampoo GmbH for distribution from the Computeractive Software Store, using the software build provided. Do not re-distribute.